Today's offering may not be for everybody. Probably NOTHING is that. It is a 14-volume CD box set that was recording during a series of concerts by the talented and dedicated large chamber Ensemble Reconsil, Roland Freisitzer conducting. 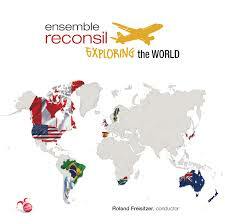 Exploring the World (Orlando Records 0014) devotes a CD each to 14 countries. Every disk gives us five or so chamber works in a high modern/postmodern vein, featuring three mostly very recent compositions (this decade) by composers from that country, plus a couple of works by new Austrian composers, as Ensemble Reconcil has their home base there. The composers are of the younger generation in the main. A wealth of compositional approaches and sonic results are on display, all of definite interest. One disk each represents the US, Australia, South Africa, Spain, the United Kingdom, Japan, Argentina, New Zealand, Singapore, Sweden, Hong Kong, Brazil, South Korea and Japan. Everything from post-minimalism to post-Darmstadt to new expressionism can be found in this veritable cornucopia of contemporary modernism. The performances are very good to smashing and in the end you get an incredibly diverse and inclusive set of programs. It was a labor of love for all concerned, clearly. It would take many pages to give a run down of all the composers and works involved. Suffice to say that we get a milestone survey of the newest of new music from around the globe, a host of composers and works, most of which the vast majority of us will be unfamiliar with. All the more reason to value what the ensemble has done. It is a tribute to the nearly selfless dedication of Freisitzer and Ensemble Reconsil. To seek out and give us world-class performances of such a global abundance of new music is a remarkable achievement. It is a monumental release that will give avant new music aficionados a huge boost on understanding something of where we are today across the globe. I plan to devote much time to re-exploring it in the months ahead! Molto bravo! Get this if you can!